The afternoon of Saturday, May 19 this year was blessed with fine weather and the hydrangeas lining the streets around Gallery Sakuranoki were particularly beautiful. 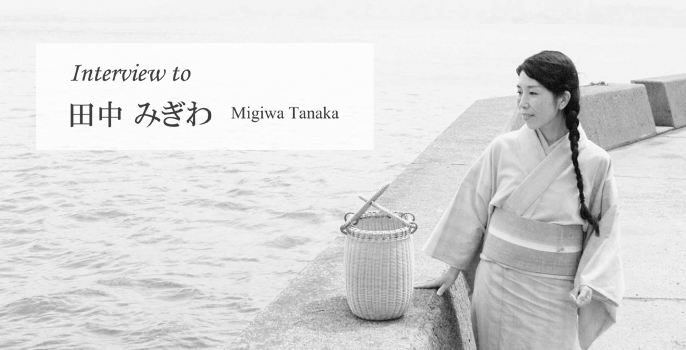 It was also the opening day of the artist Migiwa Tanaka’s solo exhibition when she gave a talk with slides showing scenic photographs taken by herself, and images of her sketches. Her talk consisted of three parts: I. Why she started sumi (black ink) painting; II. An artistic childhood; and III. Painting the moon. The following is an extract from her talk. At the moment I paint pictures with sumi and water. Firstly, I would like to talk about why I started painting with sumi. Since I was a child I have always liked nature and often spent time drawing landscapes with mountains and trees. During my university days, I drew clouds for the first time in my life, and at that time I strongly felt clouds reflected our feelings and emotions; since then I have enjoyed avidly pursuing clouds. 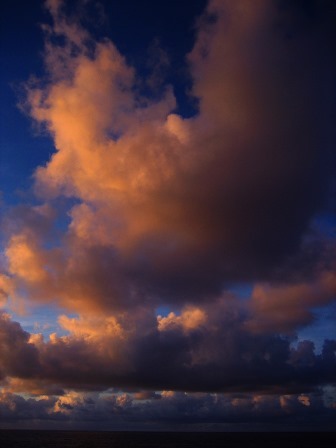 I was attracted to the vast skies and beautiful tropical seas of Ishigaki Island, where I camped and spent every day sketching; before long as the days passed by I realized that I no longer wanted to travel anymore, I wanted to stay there, breath the air in that place, and paint pictures while actually living there. After I completed my graduate course, along with a small car into which all my household goods were crammed I took the ferry across the sea to Ishigaki Island, and for the next year and a half I lived a simple life on the island and painted pictures. Through my time on Ishigaki Island I gained two things. One was tranquility. After sunset, there was a time when the wind fell away and a great quiet descended, and while I relaxed into that moment, the waves inside me also calmed down, and as my turbulent thoughts subsided, I found such stillness in the depths of my mind. Fortunately once a day, either at dawn or after sunset, I enjoyed such a quiet time; it was then that I dived deep into my heart, and feelings of peace spread like ripples across the seabed of my heart. The other thing was my experience of darkness during the night of a new moon; it was not something scary, rather I felt very warmly and gently cloaked by the dark. I realized that when I was in the darkness I became completely calm. When we have a problem, we tend to seek an answer outside ourselves, but thanks to that darkness and stillness, I was aware that the true answer is only found in the inner self. In the middle of my stay, one day I encountered a bank of crimson clouds busting into flames as if ignited by the evening sun.